“You do not know what will happen tomorrow. For what is your life? It is even a vapor that appears for a little time and then vanishes away” (James 4:14). “ It certainly adds weight to the scripture’s characterization, life is like a vapor.” This is the response I received from a friend after notifying him of a mutual friend’s tragic death. It made me pause, then reflect upon my life. Have I been wasting much precious time with things that don’t really matter? Yes, I’ll be honest, I have spent way too many moments with worry, over thinking, harboring ill-thoughts toward others, spending money I don’t have on things I don’t need (or at times, even like), trying to figure out the end results, and so on. A friend, who was a loving father, grandfather, and faithful Christian. Our friend’s son who died from cancer this past year. At the same time, she made the difficult decision to place her husband* into a nursing home. * Charlie, a dear man, who led many souls to Jesus, including my husband. Charlie selflessly visited the lonely and forgotten at nursing care facilities and homes for the disabled. Now, as his life draws near, he is the one in need of love and care. His dear wife Marilyn provides this for him, during her daily and tiring visits. These most recent losses fill me with deep sorrow and thoughtfulness, as I ponder my own impending death; when God chooses to take me to my “forever” home. Our oldest daughter and her husband recently moved into their new home, which took nearly a year to build. Jennifer recently told me that she didn’t mind all the extra effort and resources they poured into their new house, because it will be their “forever” home. I like that! We, who call ourselves Christians, should have the same outlook, as we plan and co-labor with Christ, building the Kingdom of God, our forever home. I recommit my life to wholly living for Christ and His Church. Help me, God, to prioritize my life according to Your will and purpose in my life. TRAINING CHILDREN AND GRANDCHILDREN TO EMBRACE LIFE WITH A SENSE OF GRATITUDE, THANKFULNESS, AND AS FAITHFUL STEWARDS, MAY BE CHALLENGING TO MOST AMERICAN CHRISTIANS. Let’s not only prepare our children for academic excellence, playing sports, and securing a good-paying job, but let’s help them realize their life’s purpose: To use their gifts and talents for the glory of God. 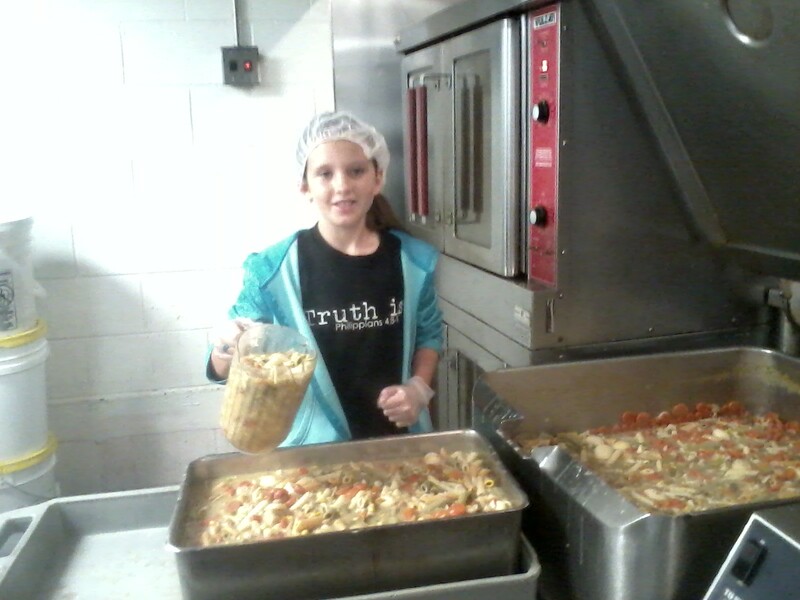 I recently spent a day volunteering at a homeless shelter with our oldest granddaughter. It was a very rewarding experience. My prayer is to have more of these kinds of opportunities with all my grandchildren…to serve others in the name of Jesus. It’s important to teach our children (age-appropriate) about death. I’ll never forget when our now 10-year-old granddaughter began asking me this question, “How does Jesus take people to heaven when they die?” After trying to explain, Ella profoundly stated, “I know, Jesus carries people to heaven with balloons.” Since then, when a loved one passes away, we release balloons. When Jesus takes me home to heaven, I hope to have a large bouquet of rainbow-colored balloons released on a warm summer day. Similarly, our 5-year-old grandson recently said goodbye to one of his pet ducks that was born with a birth defect. Jack named him Donald and was quite attached to this little white-feathered creation. Jack is beginning to realize there is a time to be born and a time to die. His parents took this opportunity to explain death and eternity to Jack. They also had a burial for Donald and placed a little wooden cross on his grave. Having experienced the death of both of my parents by age 7, I fully understand the importance of talking to children about death, and eternal life. I came across this article from Scripture Union: Talking with your children about Death… Issues to think about. Celebration Ideas for Grandparents Day, Sept. 7. Thank you for your kind words of affirmation. I always enjoy reading your blog with all the creative ideas.